I’m pleased to have obtained the official schedule for Bob Piekiel’s growing observing and lecture programs for the 2018 season. For those who have not had the pleasure of hearing one of his lectures, attending one of his observing sessions, or reading one of his many books on scope optics (or loading the CD containing the massive Celestron: The Early Years), Bob Piekiel is not only an excellent guide but likely the most knowledgeable equipment and operation guru in Central New York. * January 19 (Fri.)/20 (Sat. weather alternate), 7:00-9:00 p.m.
Winter skies at their finest, The area surrounding the constellation Orion has more bright stars and deep-sky clusters than any other section of the sky. Still good views of Uranus. * February 16 (Fri.)/17 (Sat. weather alternate), 5:30-8:30 p.m. This is a good chance to see the elusive planet Mercury, right after sunset, plus the area surrounding Orion, one of the brightest in the sky. We have to start early to catch Mercury. We might still get a good view of Uranus. * February 24 (Sat. )/25 (Sun. weather alternate), 1:00-3:00 p.m. Solar viewing program – see our nearest star with specially-equipped solar telescopes, showing sunspots, flares, and eruptions. * March 16 (Fri.)/17 (Sat. weather alternate), 6:00-9:00 p.m.
Goodbye to winter skies, but still great views of Orion. Maybe a few Lyrid meteors as well. * April 13 (Fri.)/14 (Sat. weather alternate), 7:30-9:30 p.m.
Hello to Spring skies. Watch as the seasons change both on the ground and the starry night. Orion will be setting, and being replaced by Leo the lion. * May 11 (Fri.)/12 (Sat. weather alternate), 8:00-10:00 p.m.
Spring skies will be in full view, plus Jupiter is at opposition, meaning it will be its closest, biggest, and brightest for the entire year. Venus will also be visible at the start of the program. * June 22 (Fri.)/23 (Sat. weather alternate), 9:00-11:00 p.m. It gets dark late this time of year so our best viewing targets will be bright planets and the moon. Venus, Jupiter, and Saturn will be visible. When it gets dark we will begin to see some of the southern Milky Way. * July 20 (Fri.)/21 (Sat. weather alternate), 8:00-11:00 p.m.
PLANETS! Venus, Jupiter, Mars (which will be at its biggest, brightest, and closest until 2035! ), Saturn, and possibly a quick glimpse of Mercury at the start of the program. Plus, a good view of the first-quarter moon, and then the southern Milky Way as the moon sets and the sky gets dark. * August 12 (Sun. )/13 (Mon. weather alternate), 8:30-11:00 p.m. The annual Perseid meteor shower, one of the year’s finest, the planets Venus, Mars, Jupiter, Saturn, Uranus, and Neptune! There is no moon in the sky so we will have fabulous views of the summer skies and southern Milky Way. Bring a lawn chair to sit and watch for meteors. * August 25 (Sat. )/26 (Sun. weather alternate), 1:00-3:00 p.m. Solar program – See our nearest star close-up with special telescopes that reveal flares, sunspots, magnetic storms, and granulation. * September 7 (Fri.)/8 (Sat. weather alternate), 8:00-10:00 p.m. Still a good view of the lingering summer skies, and the planets Venus, Mars, Jupiter, Saturn, Uranus, and Neptune! * May 18 (Fri.)/19 (Sat. weather alternate), 8:00-10:00 p.m.
Spring skies will be in full view, plus Jupiter is at opposition, meaning will be its closest, biggest, and brightest for the entire year. Venus will also be visible at the start of the program. * July 7 (Sat. ), 7:00 p.m.
Telescope Workshop! Tentatively at the reserve shelter, but check with Green Lakes the day of to make sure they don’t move the location depending on the weather. * July 13 (Fri.)/14 (Sat. weather alternate), 7:00-10:00 p.m. This is the best view of 5 planets we will get for the summer: Mercury, Venus, Mars, Jupiter, and Saturn, plus great views of the Milky Way when it gets dark. * August 6 (Mon. ), 7:30-9:00 p.m.
A special additional “telescope workshop” is being hosted due to popular request/demand at the well-attended July 13th event! * August 17 (Fri.)/18 (Sat. weather alternate), 7:00-10:00 p.m. The 1st-quarter moon is visible,plus and still great views of the planets Venus, Mars, Jupiter, Saturn, and maybe a peak at Uranus and Neptune. We will also have great views of the heart of our Milky Way galaxy and the many bright clusters and nebulae visible there. * September 28 (Fri.)/29 (Sat. weather alternate), 7:00-9:30 p.m.
* June 15 (Fri.)/16 (Sat. weather alternate), 8:30-10:30 p.m.
Bob Piekiel Returns To Chittenango Falls! Meet at the ball field by the main upper parking lot. It gets dark late this time of year so our best viewing targets will be bright planets Venus, Jupiter, and Saturn. We’ll also get to see a skinny crescent moon at the start of the program. When it gets dark we will begin to see some of the southern Milky Way. * August 14 (Tues.)/15 (Wed. weather-alternate), 7:30-9ish p.m. This summer we will have a view of all bright major planets in the evening sky at once, and Mars making its closest approach to earth until 2035. The moon will also be visible, along with Venus, Jupiter, Mars, and Saturn. Despite the torrential snowfall at present, we remain ever optimistic (and it’s too far out to trust any weather predictions anyway) about the possibility of clear skies on the early-early morning of March 20th, when the Main Belt asteroid Erigone will occult the star Regulus in Leo the Lion. Richard Nugent’s silent youtube movie about the Regulus occultation. Expect a small flurry of posts next week as we prepare for 14 seconds of pure adrenaline between 2:00 and 2:10 a.m. E.D.T. on March 20th (and, to clarify – because it came up – this means you’ll be staying wide awake on the 19th, pass midnight, then kill two more hours before going outside. Plenty of time to practice while you wait, and hopefully your thumb won’t freeze over waiting to push your stopwatch app). Below is the official press release by the International Occultation Timing Association (IOTA) on the upcoming occultation of Regulus by asteroid Erigone on March 20th. 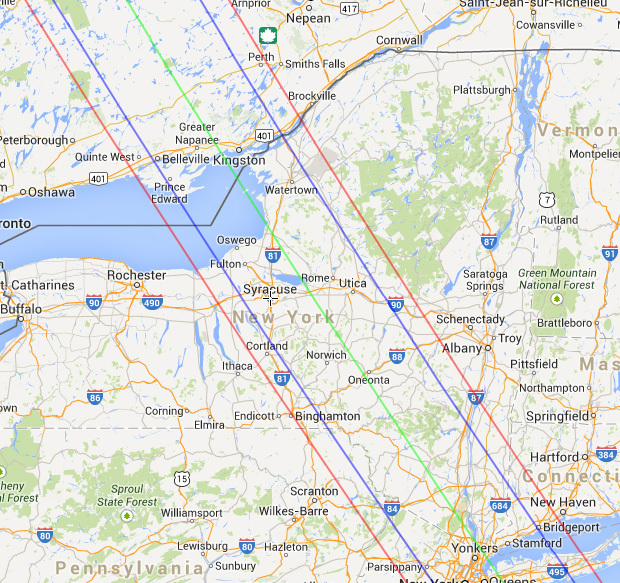 CNYO will have more to announce about our efforts to monitor this occultation in the next week or two. Meantime, this is your one-month warning! A chance alignment of orbits is predicted to cause Regulus to “wink out” as the mammoth asteroid Erigone passes directly between Earth and the star, temporarily blocking its light from reaching us (the asteroid itself remains in its normal orbit which never comes anywhere near Earth). 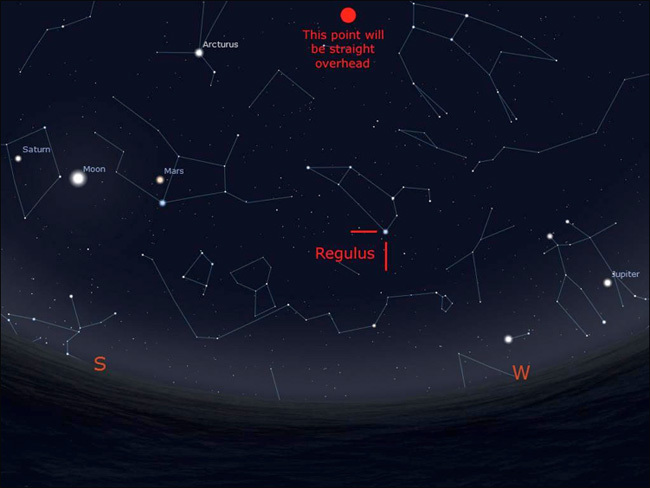 Regulus (the star which will wink out) is in the constellation Leo the Lion and, as one of the brightest stars in the sky, is easy to find. Members of the public with additional questions should refer to the FAQ page at www.occultations.org/Regulus2014, email regulus2014@occultations.org or see the article in the March, 2014 issue of Sky and Telescope Magazine. 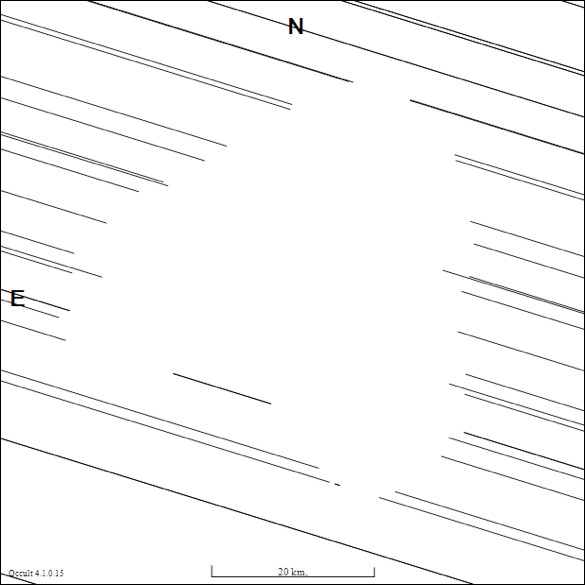 The International Occultation Timing Association, with its worldwide sister organizations in Europe, the United Kingdom, Australia/New Zealand, Japan, S. Asia/India, Mexico, Latin America and South Africa, provides free occultation predictions and planning and analysis software, sponsors online Internet discussion groups and publishes the Journal of Occultation Astronomy. The main IOTA webpage is www.occultations.org. The Yahoo discussion group can be found at http://groups.yahoo.com/neo/groups/IOTAoccultations/info and is open to all with an interest in this topic.